The federal rates have been hiked. Jerome Powell chaired Federal Reserve has voted to raise the federal rate to 1.75%. The balancing act by Fed has come at a time when inflation is rising. The rate increase is happening for the sixth time since the 2007-2009 recession. Below is a list of previous rate hikes and the dates. According to surveys, the economy of US is growing positively with slightly higher inflation than 2% target. Unemployment has reduced and financial markets are largely booming. Fed expects the unemployment to reduce from 4.1% in the coming months. By year-end, the rate could be 3.8%. As of March 2018, the fed has increased the interest target range by a quarter percentage point lie between 1.5% – 1.75%. There could be another two to three hikes in 2018. Fed is expected to increase rates over the next two years. The rates are expected to be raised two to three times in 2019 and two times in 2020. There can be anywhere between 8 – 9 rate hikes until the end of 2020. Many economists are projecting a settling range between 3.25% and 3.5% by the end of 2020. If the interest rates are raised too slowly, the economy may boil heightening the risk of a recession. On the other hand, if the hikes are aggressive, inflation could fall below 2% target. That will destruct the Fed’s credibility. Thus, Fed as always is trying to play a balancing game. The intent is clear from Powell’s statement given below. Fed officials expect growth will increase due to the addition of tax cut. The GDP expectations by Fed for 2018 and 2018 are the following. Based on Fed’s estimate, the economy would likely expand 2.7 percent this year, more than the prior forecast of 2.5 percent. Note: Fed expected GDP rise is lower than the policy makers prediction of 3%. The rate announcement was on Wednesday. On Thursday major indexes were falling. (The fall reflects a usual short-term reaction by markets after a rate hike). Below is a table showing how some of the popular indexes performed on Thursday. 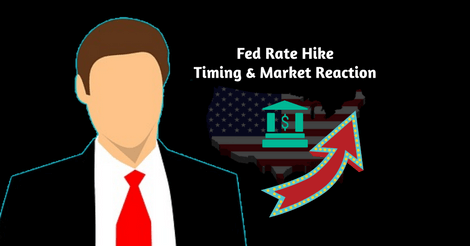 Based on the above data, the large, mid and small caps saw drops around 2.5% on the following day of the rate hike. Regarding treasuries, the yields were rising while the prices were falling. CME Group, the operator of one of the largest futures exchange, displays probabilities of future rates. On March 26th, the data-driven tool of the CME group was showing the below probabilities. There is a 43.18% chance for the rate to hit 2% – 2.25% by the end of 2018. Also, there is a 28.3% chance for the rate to hit a range of 2.25% to 2.5%. Why IBM Acquired Red Hat?